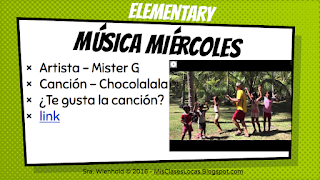 It is so fun how many classes use Música miércoles as a part of their weekly routine. I know that for many teachers they have to be very careful with their choices for extra appropriate songs and videos. 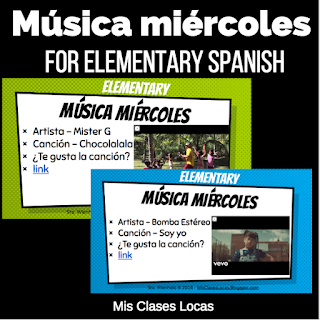 To meet that request, I created Música miércoles for Elementary Spanish. 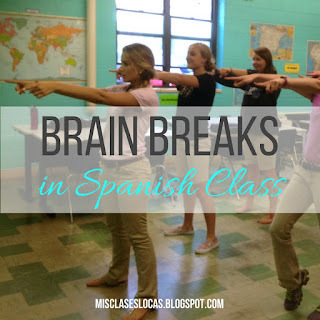 These music bell ringers or brain breaks will start an elementary Spanish class with a bang! The culture filled songs would be great for elementary or middle school Spanish 1, as a classroom management routine or brain break. 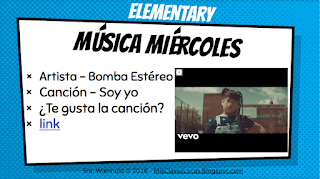 In my class "Música miércoles" is the student's favorite day of the week! This slideshow includes mostly popular pop songs, with song classic children's songs mixed in. I understand that each school culture is different, so if you would like a list of the songs that are included to make sure they are appropriate for your situation, please contact me. What are your favorite songs for Música miércoles? Please share below! Is your newsfeed full of collages of your friends and the 3 fictional characters that describe them like mine is? Well the teacher in me sees this as a perfect way to connect with novice or intermediate language learners! Students create a quick collage with the three fictional characters that describe them. Depending on technology resources available it could be made on PicMonkey.com, a Google slide, a collage app on student cell phones, or an old fashioned paper and glue collage. Then there are many options depending on language level. These collages are posted around the room and students must go around and describe them, and guess who is who. Have a gallery walk, or simultaneous presentations where students describe who they picked and why, with follow up questions by their listeners. For intermediate students, describe them using conditional if clauses such as, "I I could be a fictional character I would..."
Have students complete a free write about who they chose and why. Search #3fictionalcharacters or #describemyselfin3fictionalcharactrrs on Twitter or Instagram to come up with random collages that students must describe, or decide what friend this person is most like. Let students post their collages using the hashtag, and then comment on each other's in Spanish online using class accounts. Create a collage for a character in a book you are reading or a famous Hispanic for Hispanic Heritage Month. What other ideas do you have? Please share! As the school year is starting, you may be knee deep in teaching your tenth novel, or working on starting your very first one. Either way here are some tips to keep it successful for everyone. Remember this will only be my third year teaching with TPRS novels, so I am still learning and growing. I do not claim to be an expert, just someone who has figured out best practice for me. I am a big fan of starting with a novel that is easier than the level of the class. Why? They build Confidence and make reading FUN. My first year teaching I had my Spanish 4 class read Cajas de Carton as their first novel ever. IT WAS TERRIBLE. It was way too hard, the students just got frustrated and gave up, so I felt defeated and doubted if using a book was a good choice. Check out this ranking of the novels by Bryce Hedstrom as a starting point. Also, here is a page with Posts sorted by novel, to see what I have taught when. When in doubt, start easier and work your way up. If the book you are teaching has a teacher's guide, you MUST buy it. Yes, they are expensive, but that is because they are worth their weight in gold and are FULL of amazing ideas, resources and will save you a ton of time. Your time is precious, do not waste it doing the work that has already been done for you. If you are teaching a new novel that does not yet have a guide, search Pinterest, blogs and the Internet before you try to reinvent the wheel. 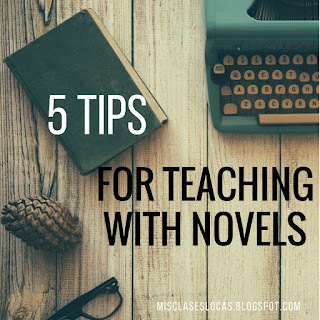 Check out Novel Basics - Part 1 - Research & Find Funding to find out how to get this guide paid for and Novel Basics - Part 2 - Organize & Plan to get ready to teach. Finally, if it will be your first novel, read How to Teach Your 1st Novel and Teaching a Novel 101 - Presentation. Once you have chosen your novel and devoured the teacher's guide, it is time to see what else is out there. I always search Pinterest, blogs and the Internet to get ideas of what others have already done with the novel. Follow #langchat and teachers are always tweeting new, current authentic resources to go with novels. If you do not see what you need, tweet out a request or post a topic on the IFLT Facebook page. You will get many helpful replies right away. My novel resources page is where you will find links to all posts about novels I have taught. How I personally use the questions provided by the teacher's guide is projecting them in a slide show while we read the chapter. This prompts me to stop and discuss the questions as a class, circling and working together. I typically have only assigned students to fill these out as a one day sub plan, usually after we read the chapter the day before. If you are centering your class around novels, you have to mix up each chapter or it will get VERY boring very fast. Make sure to only introduce a couple new key vocabulary words each chapter. Any more than this and you should have picked an easier book. I personally do a lot of the culture front loaded before starting the novel, such as films and authentic readings. Once you get started reading, who wants to wait a whole week for the next chapter. You have to keep momentum for the novel to stay fresh and entertaining. Here are a few posts I have on mixing it up - Teaching a Novel? Spice it Up!, 5 Activities for a Novel & No Prep Post reading activities for any novel. 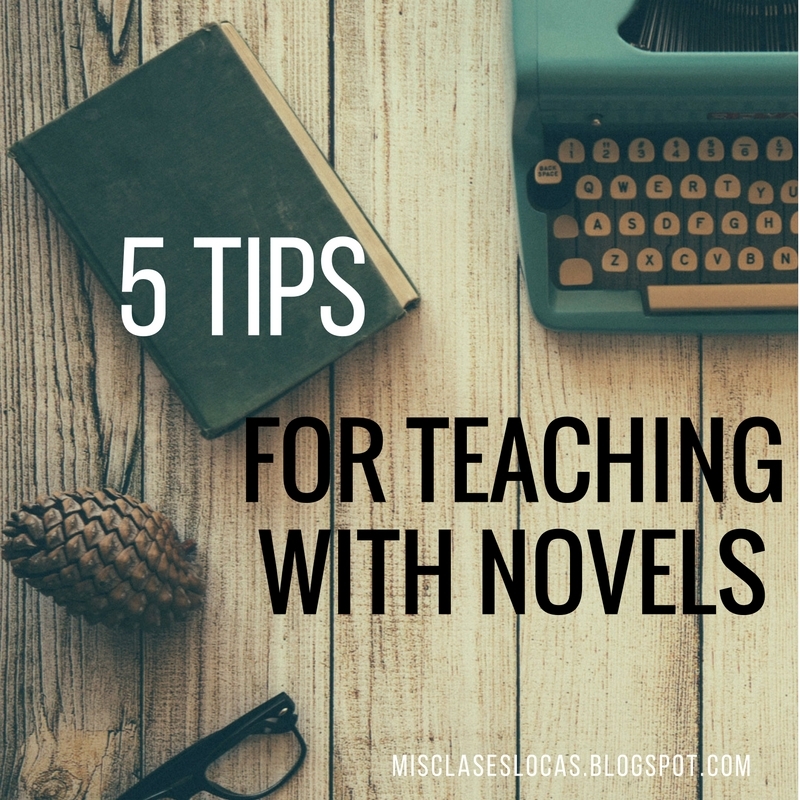 What are your top tips for teaching with novels? 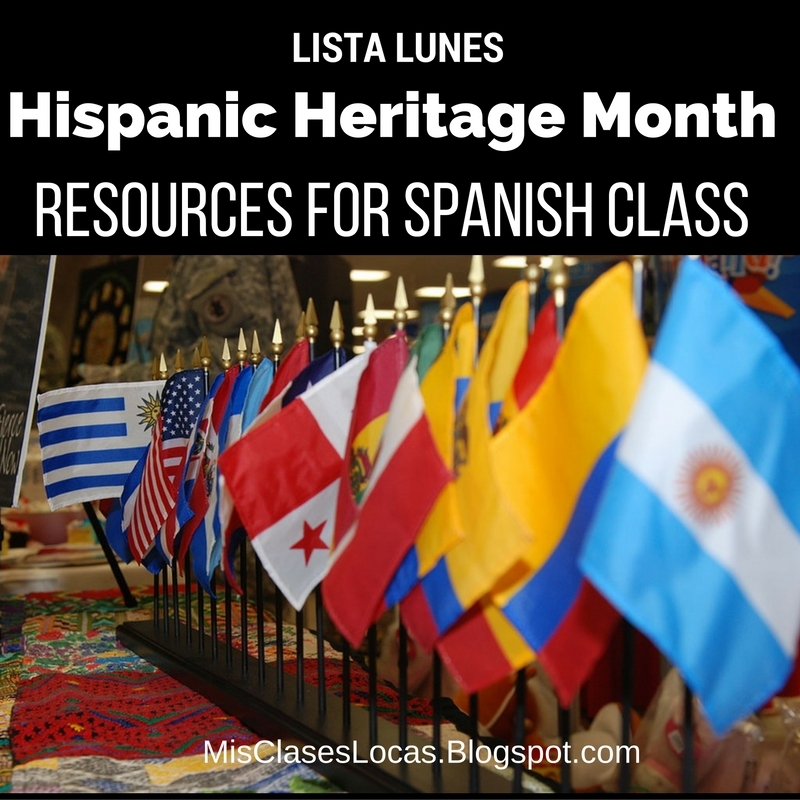 Every year Hispanic Heritage Month is celebrated from September 15 - October 15. It is the perfect opportunity to infuse your Spanish class with culture. Here are some resources from around the web to make planning this month a breeze. Since I am currently not in the classroom on maternity leave, I can't just try this method out tomorrow like I would usually do once I get a new idea (perks of being a #deptof1). The biggest change that I need to wrap my head around is notice how class starts, input. It does not start with "para empezar" bell ringer. Some of my most popular posts ever revolve around para empezar, which as someone recently posted on Twitter, is more of a management tool than a student learning tool. Ouch. It may sting a little, but I completely agree. At the same time, as a new teacher it was the management tool that helped save my sanity teaching four separate preps. Am I saying that as a new teacher sometimes management has to come before optimal student learning? Yes. As a fresh teacher effective management leads to teacher sanity, which leads to the teacher returning the next day and year, which leads to the teacher finding better ways to provide optimal student learning. I guess that as a now fifth year teacher I am past the new teacher phase and have the management more under my belt (I like to call that student relationships), and can officially move into optimal environment for student learning. So how is this going to look in my classroom? 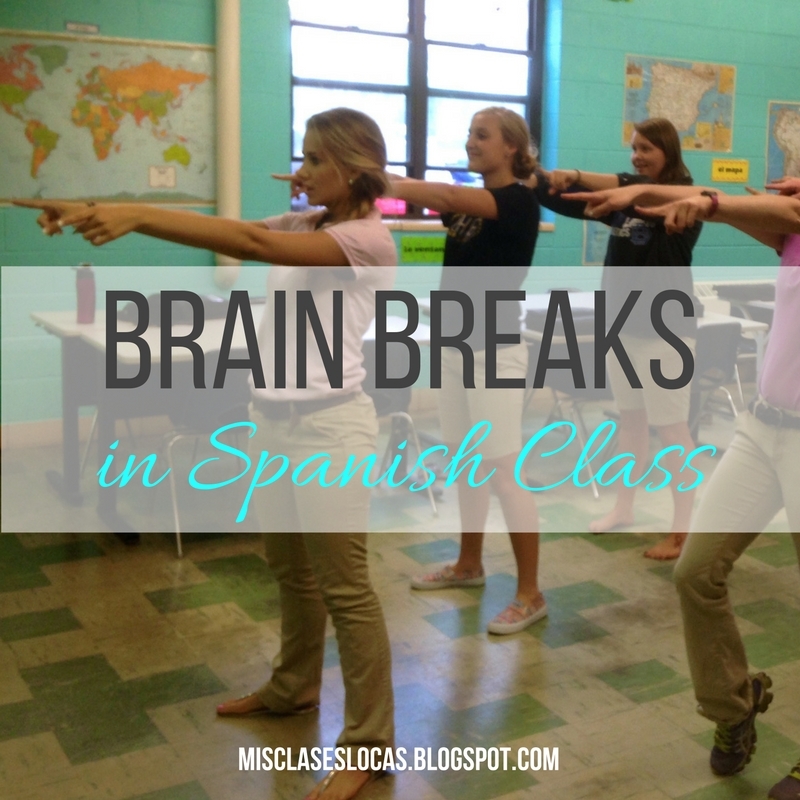 Instead of starting class with my para empezar activities, they will become brain breaks! Music, dance, jokes, memes etc, all make for a perfect way to break up class. I have actually used many of these activities as brain breaks in the middle of class for years, but without using the fancy lesson planning template. When I see that a class needs a mental break or to get up and move, my go to has always been to put on a baile viernes song. I have even used being able to dance as a "reward" for completing an activity. I am going to stick with the particular days for brain breaks with música miércoles and baile viernes, for continuity sake, as I think I would have some upset students to loose these special days. On the other days I hope to mix it up using these activities for novice or intermediate students, and some of the new brain breaks (to me) I have listed below. My question for those of you well versed in primacy/recency lesson planning is where does SSR/FVR free reading fit in? Can I start class with it as input #1? These are just some things to ponder as I snuggle baby boy while watching more Netflix than necessary during middle of the night feedings.